Nothing says spring like a lush succulent terrarium. 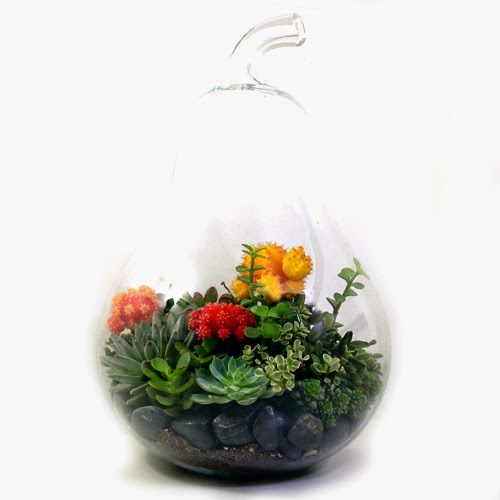 Looking for succulent terrarium inspiration or perhaps looking to purchase? The Houston Chronicle recently had a small write up on Vernon Caldera's terrariums. While I tend to build sparse terrariums to allow for plant growth, a densely packed terrarium like "Oz" (pictured above) is ready for the immediate spotlight on a dining table or entryway. If you are looking for a quick display craft rather than a long-term terrarium planting - select small cacti and succulents with blooms ready to open.